My Yard Is Full Of Holes! Dogs will be dogs and dogs like to dig. Digging is normal behavior for dogs. However, it can become overly destructive and can become a sore point in the relationship between the human family members and the family canine. Behaviors and activities that are normal for dogs are often very difficult to change or eradicate by discipline, training, or punishment. When a dog's natural or normal behavior, such as digging or chewing, is destructive or inconvenient for the dog's owner, it is much easier to redirect that behavior than it is to eliminate the behavior. Therefore, if your canine family member is destroying the landscaping in his or her urge to excavate, the easiest solution is to teach him or her to dig in a more suitable or acceptable area. 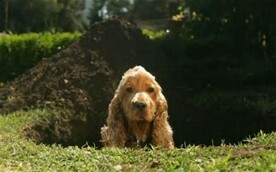 Digging is natural for dogs. It is part of dogs' hunting heritage in which unearthing prey from their burrows was a necessary part of procuring the daily meal. In northern breeds such as Huskies, Malamutes, Elkhounds, and Samoyeds, digging and burrowing in the dirt can become a consuming passion or obsession. Punishment for digging simply does not work to dissuade the earth-moving canine. At best, the punishment may cause your dog to select a different part of the yard to destroy. 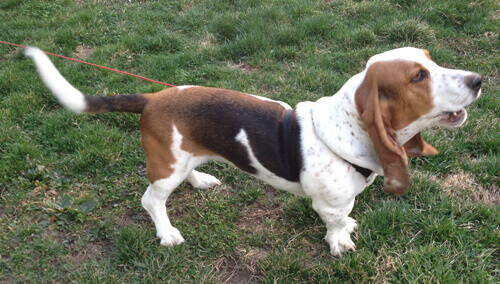 However, it can also result in doggie devastation all over the yard! Dog behavior specialists recommend redirecting your dog's behavior by providing an approved area for your pet to dig to his or her doggie heart's desire. It is much easier to redirect the dog's digging behavior to a small acceptable and expendable area than it is to try to eliminate digging completely. So, create a digging play area for your dog. Teach him or her to dig there and reward the dog for digging in the appropriate area. To create a digging play area, select a spot in your yard where the digging will cause the least inconvenience. If digging out of the fence is the problem, it would not be wise to position the digging play area adjacent to the fence. The designated digging area needs to be bordered, so that both you and your dog can agree on its limits. For small dogs, the area should be about 4' x 4', bordered with 2" x 4" boards. For large dogs with the urge to move the earth, make the area 6' x 6' and frame it with landscape timbers. Spade the dirt within the digging play area so that it is enticingly dig-able. Try to avoid having any fresh dirt outside of the wood frame. It is best if the dirt outside the frame is covered with gravel, rocks, grass, or bark right up to the edge of the designated doggie digging area. Train your dog to use his or her doggie digging area. You may demonstrate that it is OK to dig by getting right down there and demonstrating how to dig, using your hands. Your dog will think you've flipped and the neighbors may laugh or stare. It's ok. Just console yourself with the thought of no longer having to fill in endless holes under your fence and in your yard. The next step is to bury a few of your dog's favorite toys and treats (i.e. a rawhide chew, ball, bone, etc.) so that they are partially visible. Then when your dog digs them out of the ground, praise him or her. Be sure to use an enthusiastic tone of voice when you praise and play with him or her for a while. Now, bury the toys and treats again, a little deeper. You may need to repeat praise, play, bury sequence several more times. Your dog will learn that he or she gets rewarded for digging in this area. Further, digging in this area becomes a fun game. Eventually, you dog show show a preference toward digging in their special doggie digging area rather than in the middle of your lawn, under the fence, in your flower beds, or under your shrubbery. Our doctors are always happy to consult with you and provide behavioral counseling for your pets. Call us for an appointment if you desire further help or information.